I spent four days in Hanoi with my trusted co-pilot and staff photographer Sadie (probably more of an intern as she is decidedly unpaid). We spent one day in Ha Long Bay, but otherwise basically ate and drank our way through the city. Here are some of my favorite things we did. Food Tour with Mark Lowerson - Mark is an Australian who has been living in Hanoi for over fifteen years. With him we ate pho, several noodles dishes, a roasted banana tapioca dessert, a banh mi and some of the best spring rolls of our entire stay in Vietnam. It was fascinating to get his perspective on the ex-pat experience in the city and how it has changed. The tours are expensive, but I would recommend them above almost anything we did while in the city. Noticeable French influence on these spring rolls: the wrapper is super flaky and light, almost like a pastry. Hanoi Cooking Centre - Cooking classes are fast becoming one of my favorite ways to get to know a place. In this one, we made spring rolls, pho, bun cha, and a delicious fruit salad with coconut milk. We also got a tour of a nearby food market, which was fascinating. I, like lots of other people, am always hoping to make contact with a local when I'm visiting a new place, but it is always harder than I think it will be. 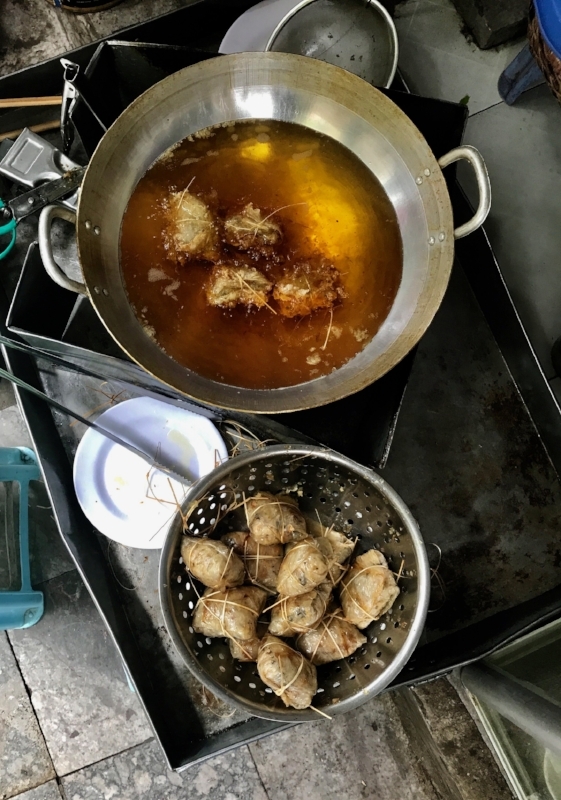 I find it is fairly rare to meet someone who speaks good English and is interested in talking to me, so the cooking instructor and tour guides I met on this were the best opportunity I had to ask locals about their lives in Hanoi. They were informative, open and very kind. They also let you drink as much beer or wine as you want during the cooking class, which felt like a very authentic cooking experience to me as that is typically how I operate in my own kitchen. Looking out of the market across the lake. The Vietnamese Women's Museum - Because we were only in northern and central Vietnam, we didn't do much of anything related to the Vietnam War (also known as the American War). The only exception was the third floor of the Women's Museum in Hanoi, which was dedicated to the stories of women who were involved in the war. Their letters and diaries describe, firsthand, the atrocities that they experienced and what it was like to specifically be a woman in the war. It was a perspective I'd never heard before and I was fascinated. Get the audio tour, because it includes translated readings of these documents. The whole museum is good, but we particularly enjoyed the third floor. Coffee - Vietnamese coffee is DANG GOOD, y'all. I'm working on some recipes to keep us cool and jittery (my ideal state) throughout the summer, but in the meantime you should probably start planning a coffee-centric trip to Hanoi. I think of Vietnamese coffee as strong coffee served over ice and sweetened condensed milk, but that is only the beginning! Hanoi is famous for egg coffee, which sounds weird but is SO GOOD. It was invented in the 1940s during a milk shortage, and has become a total cultural icon, attracting locals and tourists side by side in a way that I've found is fairly rare. There's lots to do in Hanoi, but some of the most wonderful moments we had involved sitting in a street side cafe or by the window in a hidden upstairs spot, just removed enough from the chaos of the city to appreciate its beauty. Some highlights were Cafe Dinh, Cafe Giang, and Oriberry Cafe (where you can buy single origin Vietnamese coffee) (I brought home approx. ten pounds). Weekend Night Market/Party - Every weekend after about 7pm, most of the streets north of Hang Dao in the Old Quarter become pedestrian only and street performers and market stalls are set up. It's a hilarious mix of family fun and people being wildly drunk. Local families come out and wander the streets, or post up at one of the tiny outdoor tables and just watch the world go by. With beer at approximately 50 cents a pint, it is basically required to be a good time.